Proper care coordination depends on a longitudinal care plan that all members of a care team can view, contribute to, update, and distribute. Such a plan must also be patient-centric, holistic, interdisciplinary, and dynamic. Naturally, it will be digital and likely reside in the cloud. Most healthcare organizations (HCOs), not surprisingly, are several years away from this type of care plan. It doesn’t help that the Centers for Medicare & Medicaid Services (CMS) and Department of Health and Human Services (HHS) have been quick to emphasize the need for coordinated care but slow to explain how HCOs should implement it or expect to get reimbursed for it with the exception of CCM coding. However, the industry’s ongoing shift toward value-based care (and reimbursement) means that forward-thinking HCOs need to understand the technical and strategic challenges and opportunities associated with care coordination, even amid growing regulatory uncertainty. It is with this need in mind that Chilmark Research releases its latest Insight Report: Longitudinal Care Plans: Delivering on the Promise of Patient-Centered Care. 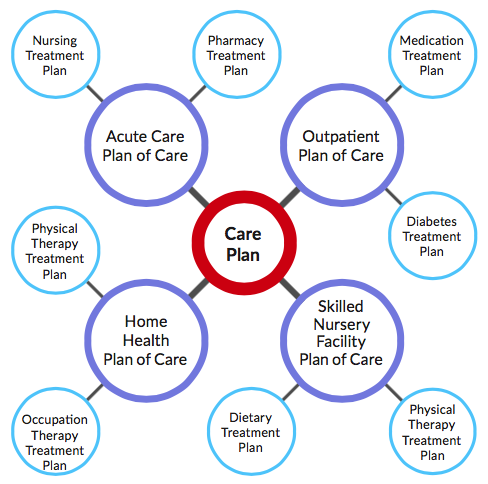 The report identifies the most important elements of a longitudinal care plan, describes the steps that HCOs should take to facilitate coordinated care, methods being being used to populate the data within care plans, indicates which data elements should go into a care plan, and provides best practices for using care plans in inpatient, post-acute, and behavioral health settings. In addition, the report evaluates off-the-shelf care plans from evidence-based clinical content vendors as well as three physician specialty societies. As you may have noticed, the report focuses on the term longitudinal care plan. The word choice is deliberate – Chilmark Research sees this type of care plan playing as vital a role in care coordination as the longitudinal patient record. Both capture information from numerous sources – many beyond the traditional episode of care – to provide a complete picture of a patient’s health and well-being (in the case of the record) and of the path necessary to maintain and improve health and wellbeing (in the case of the care plan). At the moment, a longitudinal care plan exists largely in theory. Individual care plans remain in silos in the offices that created them, disconnected from outside facilities. In the absence of digital connections, transitions of care must be accompanied by paper documents and phone calls. Patient access to the plan is all but absent. So far, the health systems that Chilmark Research interviewed for this Insight Report have been able to begin to focus on filling care gaps as they have embarked on the care coordination efforts. While this is a laudable achievement – especially given the effect that even the most rudimentary care coordination can have on clinical workflow – it also shows just how far HCOs must go in order to achieve the reality of a true longitudinal care plan. Longitudinal care plans represent a possible means to achieve the goal of greater care coordination both across and outside the HCO. This report provides a thorough overview of what steps HCOs need to consider when they are going to begin deploying a longitudinal care plan, the current status of longitudinal care plans across various care settings, and recommendations that HCOs should consider to successfully adopt and utilize longitudinal care plans. A must read for any organization or vendor looking down the barrel of widespread performance-based contracts. For sales inquiries, please contact Sean Campbell, or go to the report sales page to purchase directly.